Road-Rail vehicle DUOTRACKTOR HNJ-RP is designed for ride and work on road as well as for ride and work on state, regional, and plant railway tracks. 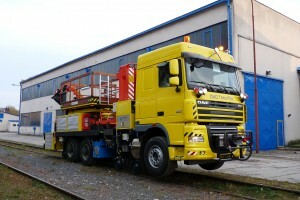 The vehicle is equipped with boom platform RP 400 and hydraulic crane PK 18002 EH-C. The vehicle is designed for ride on rails of railway gauge of 1435 or 1520 mm (adjustable railway gauge). Boom platform RP 400 enables full unlimited rotation around its axis. 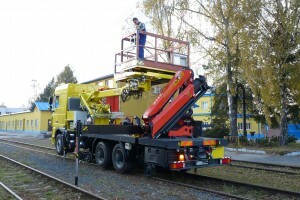 Side reach, size and loading capacity of the platform meet all requirements for OLE maintenance. The elevating platform has a remote control, it can be controlled from a mobile control panel. Power transmission during ride on rails is enabled by vehicle tyres. Mechanisms are driven hydrostatically and are controlled electrically from the driver’s cab as well as from the side control panels on the vehicle. The vehicle is equipped with CCTV cam system for safe reverse ride, monitored on colour LCD display in the driver’s cab. Rail gears as well as the working platform are illuminated for work at night.